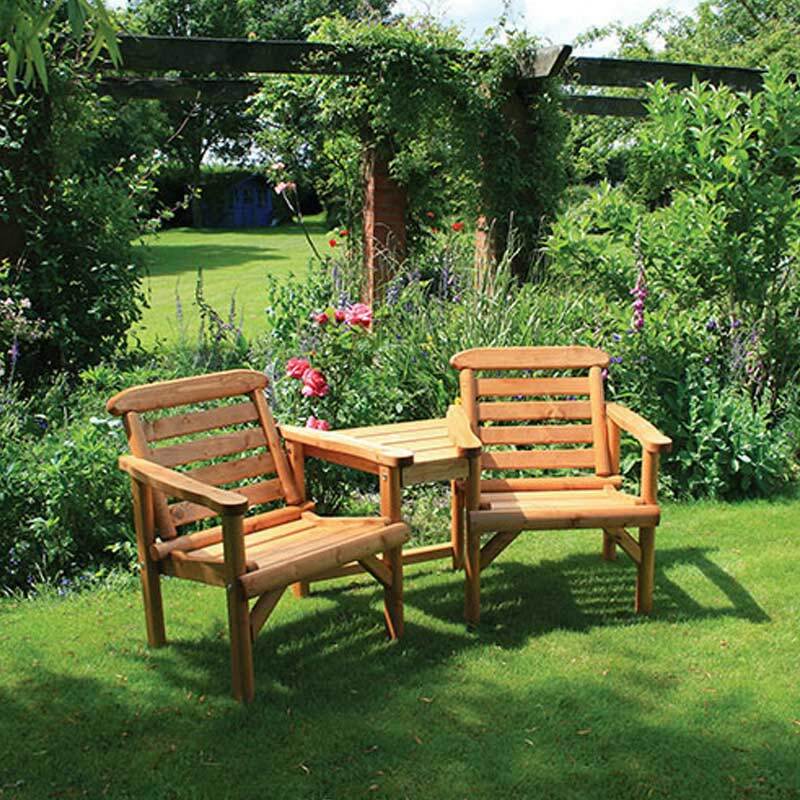 This Woodshaw Thornton Companion Seat makes a truly charming addition to your garden or patio. 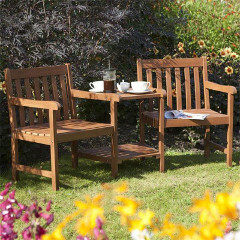 A companion seat is the perfect place for a catch-up with a friend or loved one as you enjoy summer days. It is a wonderful way to relax and enjoy good conversation or simply take pleasure from the peace and quiet of your surroundings. Stylish and comfortable, this quality alcove seat benefits from a rural design and is well worth investing in for its durability alone. 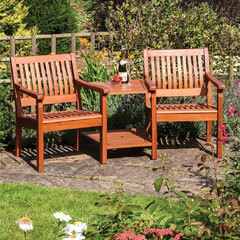 If you have limited space, this companion seat is a great alternative to a full size garden bench and it even features a handy table for you to place drinks or snacks on. A great value product that also looks good in conservatories or on balconies. Sturdily built from FSC Swedish pine which ensures sustainability and durability, it has been pressure treated to protect against rot, and has also been treated with a waterborne stain. 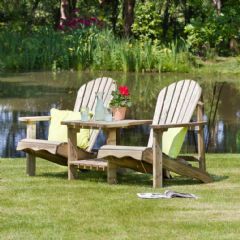 It makes a lovely addition to any garden both as a comfortable seat and as a beautiful focal point. Very pleased with this companion seat, its good quality for a reasonable price , my husband put it together but he seemed to have no problems with it . The only little down side was the colour of the wood it was more of an orange colour but not unpleasant and it really does on the whole compliment the garden. ordering and delivery was good too . Sturdy, attractive seat. Good value. Extremely pleased with the Seat. Very good value for money in comparison to that sold at local garden center. Speedy delivery. 4 nuts were missing from the pack but these were forwarded within two days following my phone call. Will definitely use Greenfingers again. Easy to assemble and just as described. Delivery spot on. Great product and being put to good use. Very pleased with my companion seat, looked everywhere for a similar replacement of one I had a few years ago & finally found one, item arrived quickly and was easy to put together, looks great in garden & very comfortable. 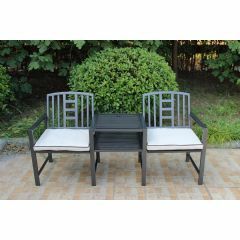 We had been searching for one of these chairs for a while but either the selections were cheap and flimsy or good quality and pricey until we hit on Greenfingers site . The set was identical to ones we had found in our garden centres as near to home as possible but much more affordable taking into account we would have had to pay even more for delivery had we of bought locally . the expected delivery date given was also a bonus as you could work it around your time off. very easy to construct by 2 people instructions are easy to follow .Here's to a nice long summer now to enjoy this item . Seat arrived in kit form and took a while to put together, but the results were worth it. Great addition to the garden. Product arrived when the delivery people said it would in two parcels secured with thick polythene. Very easy to assemble, the instructions suggested it was a two person construction, but I managed it myself in under an hour.. Instructions were easy to follow and all the pre drilled parts fitted well together to make a very sturdy companion set. We are more than happy with the seat. First class delivery. Fairly easy to assemble. Very pleased with its quality and would recommend to anyone.